ERPists – click to jump to the main point of this blog, which is about plotting measures of confidence and variance. 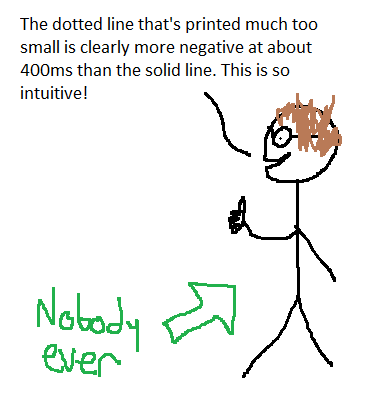 Or just read on from the start, because there’s a lot of highly proficient MS Paint figures in here. UPDATE! The paper where this dataset comes from is now published in Collabra. You can read the paper here and download all the raw data and analysis scripts here. 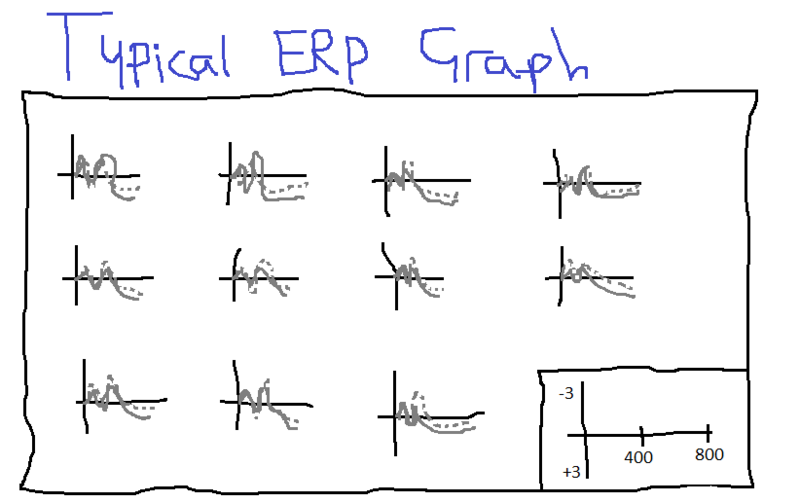 ERP graphs are often subjected to daft plotting practices that make them highly frustrating to look at. Some of these problems are to do with standard practices; others, due to lack of expertise in generating graphics; and more still are due to journal requirements, which generally specify that graphics must conform to a size which is too small to allow for proper visual inspection of somebody’s data, and also charge approximately four million dollars for the privilege of having these little graphs in colour because of printing costs despite the fact that nobody really reads actual print journals anymore. Anyway. Many researchers grumble about these pitfalls, but accept that it comes with the territory. However, one thing I’ve rarely heard discussed, and even more rarely seen plotted, is the representation of different statistical information in ERP graphs. 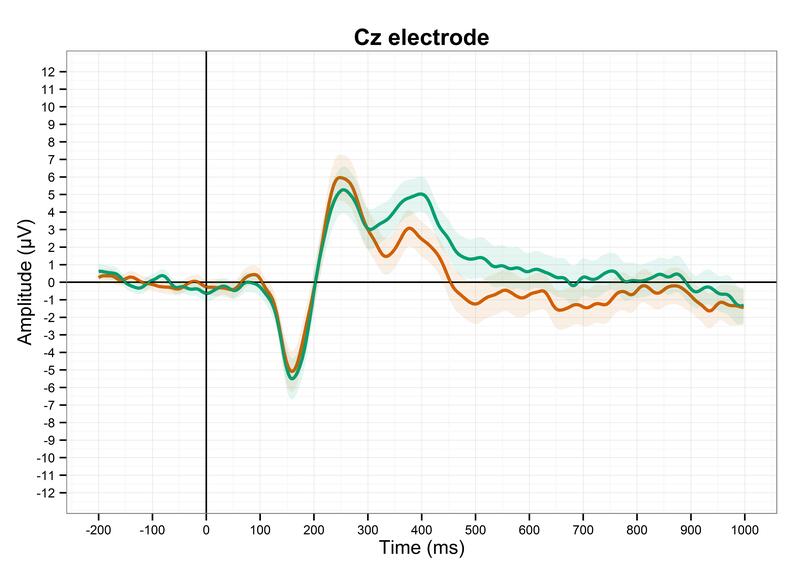 ERP graphs show the mean voltage across participants on the y-axis at each time point represented on the x-axis (although because of sampling rates, it generally isn’t a different mean voltage for each millisecond, it’s more often a mean voltage for every two milliseconds). 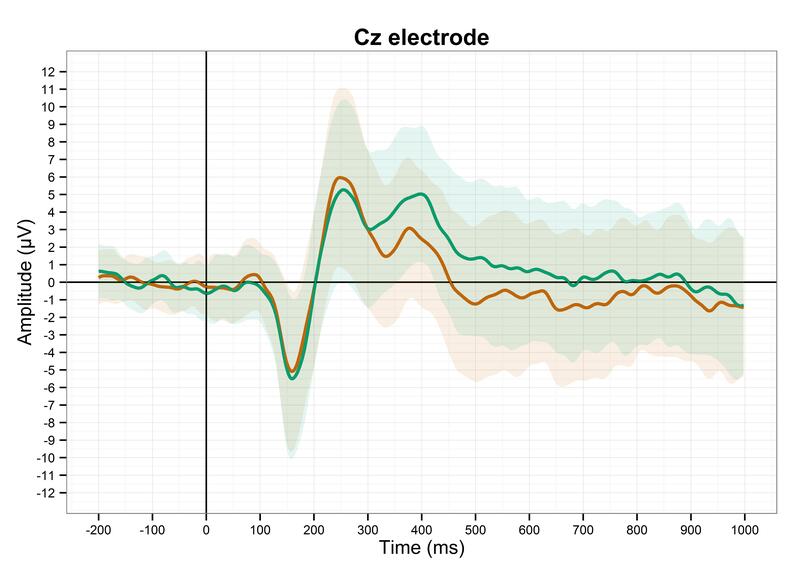 Taking the mean readings across trials and across participants is exactly what ERPs are for – they average out the many, many random or irrelevant fluctuations in the EEG data to generate a relatively consistent measure of a brain response to a particular stimulus. 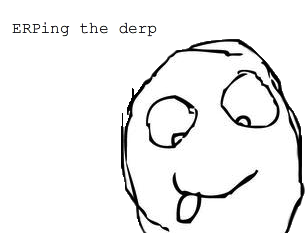 Decades of research have shown that many of these ERPs are reliably generated, so if you get a group of people to read two sentences – one where the sentence makes perfect sense, like the researcher wrote the blog, and one where the final word is replaced with something that’s kind of weird, like the researcher wrote the bicycle – you can bet that there will be a bigger (i.e. more negative) N400 after the kind of weird final words than the ones that make sense. 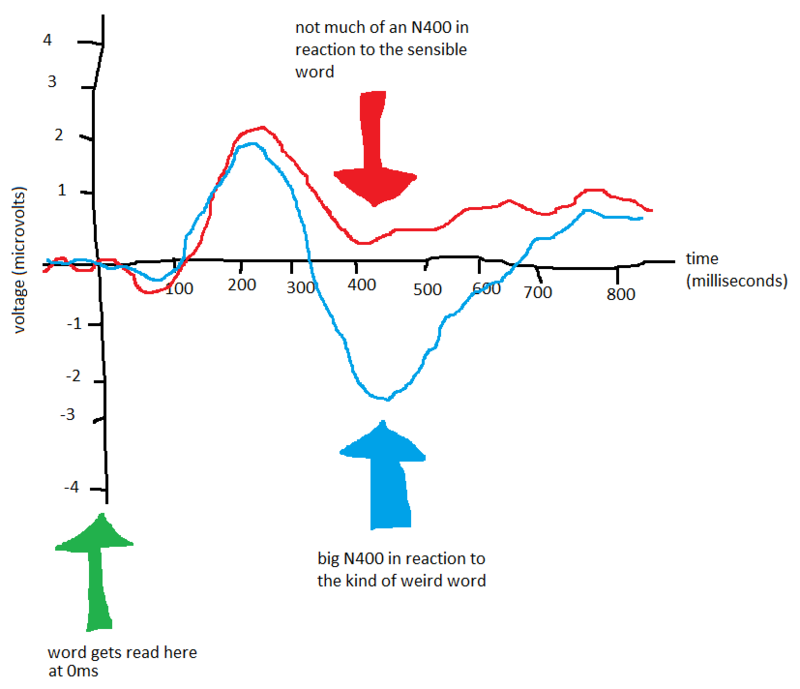 The N400 is named like that because it’s a negative-going wave that normally peaks at around 400ms. There’s a fairly clear effect of the green condition; there’s a P3 followed by a late positivity. This comes out as hugely statistically significant using ANOVAs (the traditional tool of the ERPist) and cluster-based permutation tests in the FieldTrip toolbox (which is also brilliant). But. What’s it like for individual participants? Below, I’ve plotted some of the participants where no trials were lost to artefacts, meaning that the ERPs for each participant are clearer since they’ve been averaged over all the experimental trials. Participant 9 reflects the group average quite well. 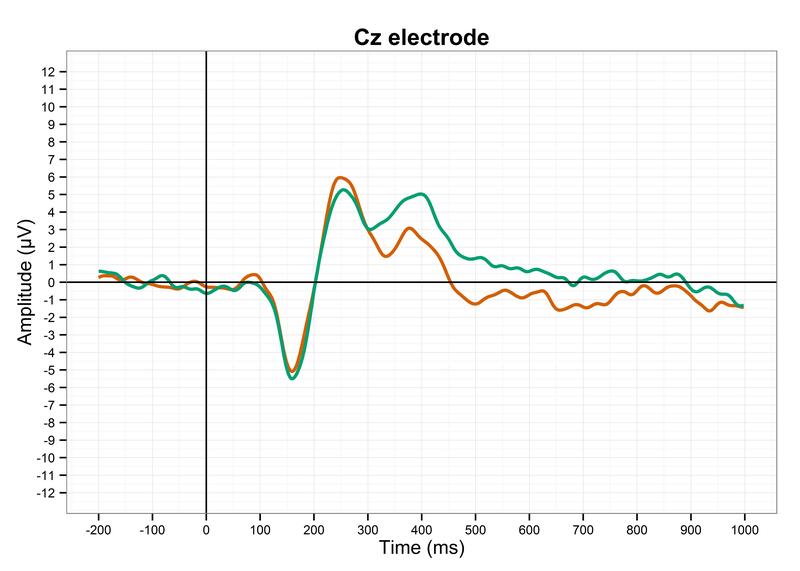 The green line is much higher than the orange line, peaking at about 300ms, and then the green line is also more positive than the orange line for the last few hundred milliseconds. This is nice. Participant 13 is not reflective of the group average. There’s no P3 effect, and the late positivity effect is actually reversed between conditions. There might even be a P2 effect in the orange condition. Oh dear. I wonder if this individual variation will get lost in the averaging process? 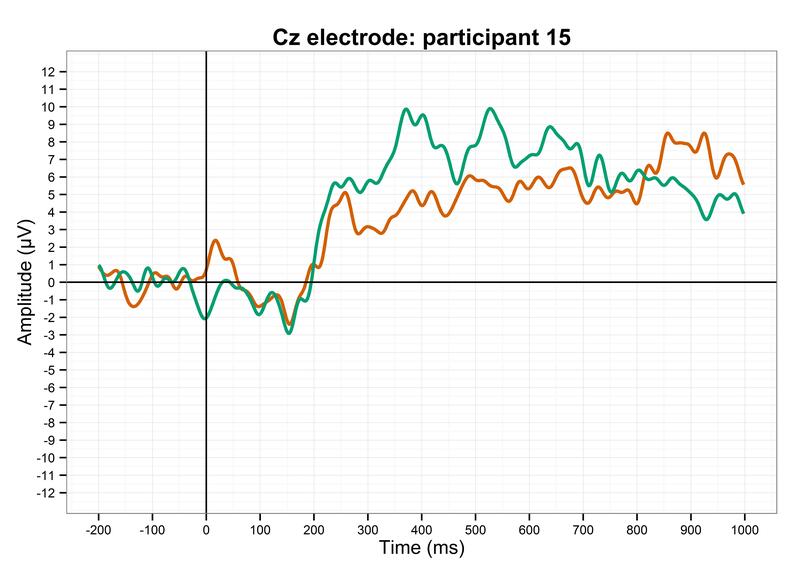 Participant 15 shows the P3 effect, albeit about 100ms later than participant 9 does, but there isn’t really a late positivity here. Swings and roundabouts, innit. 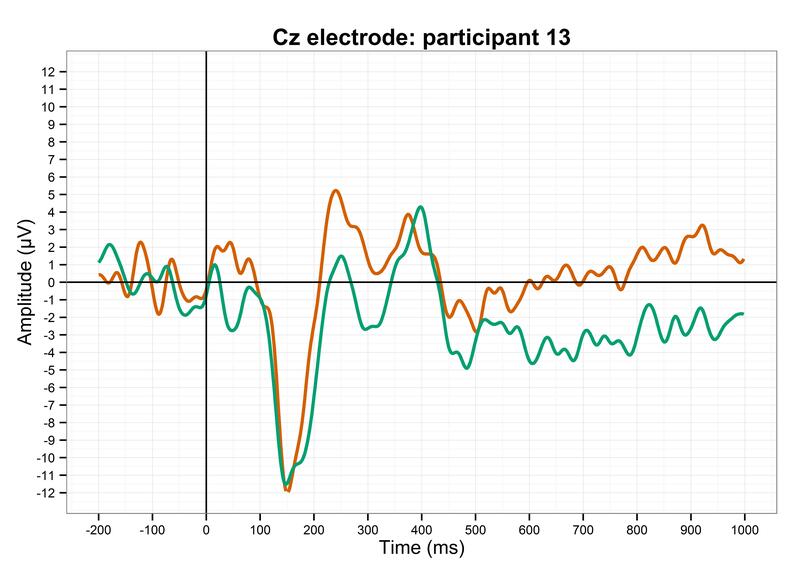 The P3 effect is fairly clear, although the late positivity isn’t… but then again, it’s only from three participants, and EEG studies should generally use at least 20-25 participants. 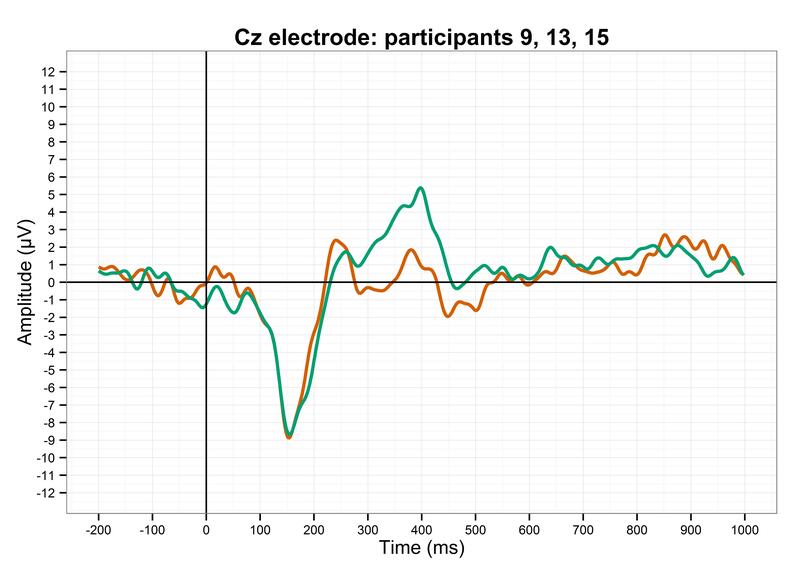 It would also be ideal if participants could do hundreds or thousands of trials so that the ERPs for each participant are much more reliable, but this experiment took an hour and a half as it is; nobody wants to sit in a chair strapped into a swimming cap full of electrodes for a whole day. So, on the one hand, this shows that ERPs from a tenth of the sample size can actually be quite reflective of the group average ERPs… but on the other hand, this shows that even ERPs averaged over only three participants can still obscure the highly divergent readings of one of them. 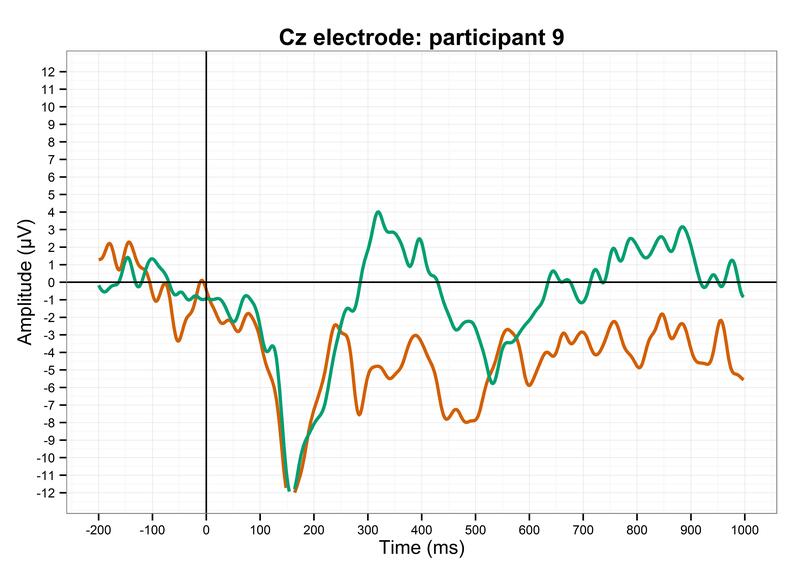 Why do we only plot the mean across all participants when we could also include measures of confidence and variance? This is pretty useful in visualising data. It’s taking a statistical measure of how reliable the measurement is, and plotting it in a way that’s easy to see. It’s nice, isn’t it? It also makes it fairly clear where the main effects are; not only do the lines diverge, the shaded areas do too. This might even go some way towards addressing Steve Levinson’s valid concerns about cognitive science data ignoring individual data… although only within one population. My data was acquired from 18-30 year old Dutch university students, and cannot be generalised to, say, 75 year old illiterate Hindi speakers with any degree of certainty, let alone 95%. …which, let’s face it, is pretty gross. The colours overlap a lot, and it’s just kind of messy. But, it’s still informative; it indicates a fair chunk of the variation within my 29 participants, and it’s still fairly clear where the main effects are. Is this a valid way of showing ERP data? I quite like it, but I’m not sure if other ERP researchers would find this useful (or indeed sensible). I’m also not sure if I’ve missed something obvious about this which makes it impractical or incorrect. It could well be that the amplitudes at each time point aren’t normally distributed, which would require some more advanced approaches to showing confidence intervals, but it’s something to go on at least. I’d love to hear people’s opinions in the comments below. Great post! I’ll use it in my reviews from now on! I totally agree with you that showing the variance around the ERP average is useful; I’ve started doing it in my own stuff recently too (http://users.ox.ac.uk/~cpgl0080/pubs/Politzer-Ahlesetal2016_XHP.pdf#page=29; http://www.tandfonline.com/doi/pdf/10.1080/23273798.2016.1151058#page=9). However, one caveat I think worth mentioning is, this works great when you’re just comparing two ERPs, but if you have three or more conditions it can get very messy. 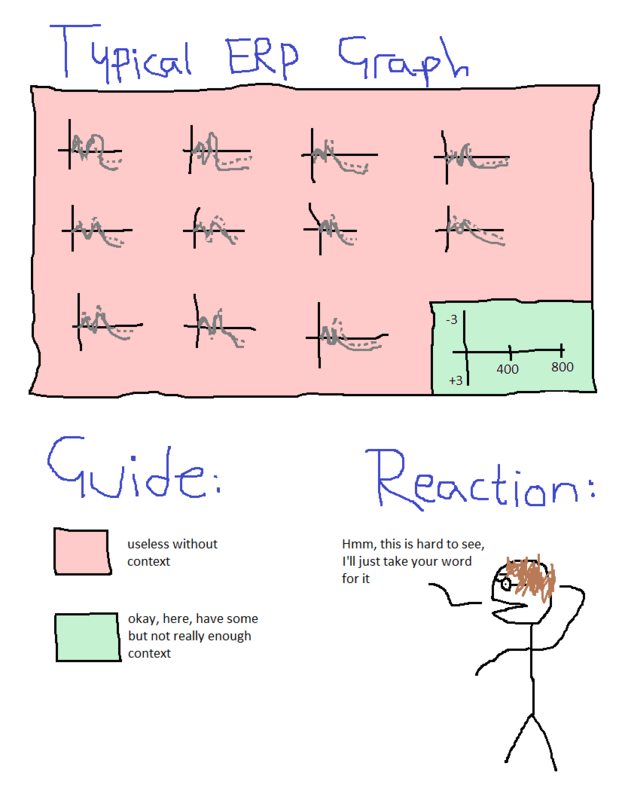 Sometimes this can be avoided (for example, if you have a 2×2 design and you’re interested in the two simple effects, you can separate them out into two different subplots rather than plotting all four together; or you can let one plot show the actual condition waves, and have another plot showing the two difference waves with their CIs around them) but sometimes not (e.g. when you have a 1×3 design). So, I try to plot waves with 95% CIs when I can, but I haven’t always been able to do it, because sometimes with more than 2 waves on a plot them adding the ribbons just makes things busy and obscures the point. Oh yeah, that sounds difficult… if you come up with a good solution I’d love to see it! I’ll keep an eye out.